To cluttered looking. This looks horrible on the iPhone. That would just give me a headache looking at it. Hey that’s cool! Off topic but what’s the name of that theme on the third picture ? My question is, do we still get the 9 pages on the springboard? looking at the last picture above i would say YES! Cant Wait for the hack…….sweeeeeeet !!! Good hack if you’ve already filled your 9 pages and need more room. 9 PAGES good lord i cant go over 6 without my phone lagging crashing and sometimes apps just not responding!!! before and after jailbreaking my phone so its not because its jailbroken. I’ll give it a try once its out just to see how it looks. Thanks Alex. Now I have to find it. It looks pretty good. (off) What’s the name of that theme on the second picture? Terrible, way too crowded. . .
whats the name of the theme in picture img_0007 ? just installed FCSB and it works like a charm! How did you get the local weather and time on your screen like that?? Can you point me in the right direction? Can you explain step by step, how you get this style? ok, 5icon and 5row dock is simple. but the rest is awesome!! Install the StyldEdit theme. SSH into your phone to the theme’s folder. Just change the locale to where you live and the theme does the rest! i have this on my iphone too i love it, its so awesome!! 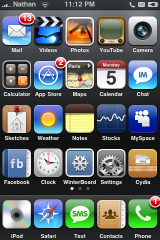 Works perfect for me ………..
hey what is that theme that you have bec i have the 5 icon column 2 and that theme is amazing! The theme is called Pump. Got it over at MacThemes. What is the first theme in the second row? 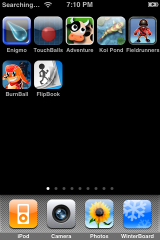 haha i have the 5 column icons @ hahaha i love it! 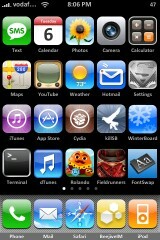 if i was to install the winterboard can i go from one theme to another if i don’t like the previous one i installed? it has no icon placement retention…..everytime the phone is reset, resprung or rebooted the icons are in some dumb random place….don’t liker that. Anyone know what happened with the official release of this hack?